Designed as the first carbon-neutral laboratory in the world, the J. Craig Venter Institute’s (JCVI) La Jolla campus embodies the goals of the pioneering research conducted within its meticulously-crafted architectural concrete walls. Home to 125 scientists dedicated to the advancement of genomic research, the landmark facility is an integral part of the Institute’s quest to conduct scientific studies capable of solving critical environmental and human health challenges. Planned to foster collaboration between scientists at JCVI, the University of California San Diego (UCSD), Scripps Institution of Oceanography and other research organizations, JVCI’s West Coast home was built on a 1.75-acre coastal site within the UCSD campus. The 45,000-square-foot facility is comprised of a separate single-level laboratory wing and a three-level office/dry research wing framing a central courtyard. A partially below-grade, 112-car parking structure was also constructed beneath the administrative building’s roof/podium deck. The facility’s light-filled laboratories feature floor-to-ceiling windows, 14-foot high ceilings and an easily reconfigurable design accommodating an ever-changing research environment. A catwalk in the interstitial space above the labs enables easy servicing of mechanical systems without disturbing the sensitive research activity below. The technical space houses a single computer data center that hosts the Institute’s high-throughput computer systems designed to operate at significantly reduced energy loads. Administrative areas support both office and research activities with configurations providing informal meeting areas, and temporary workstations for visitors. Large conference rooms accommodate both small and large gatherings and are equipped with high-tech systems to facilitate video conferencing and collaboration with researchers worldwide. The west end of the third floor provides myriad social spaces, complete with a cafeteria and small kitchen for staff, as well as a private conference room. JCVI’s genomic research focuses on both human health and environmental sustainability. When we started to design the building, we knew we wanted it to be highly energy efficient, enough so that, combined with on-site renewable generation, we could truly minimize our carbon emissions to the atmosphere. The J. Craig Venter Institute’s structural and architectural design were equally complex, requiring expertise, ingenuity and a cohesive project team. McCarthy drew upon its experience in architecturally-exposed concrete designs and green building to successfully deliver a high-quality facility while working within the Institute’s compressed budget and timeline. The building’s sustainable design features greatly contributed to the project’s architectural and structural complexities. Requiring specialized equipment and ventilation systems, traditional wet labs used in biological research are typically classified as high energy use buildings. Yet, the JVCI project team was charged with meeting U.S. Green Building Council LEED Platinum Certification standards and creating the world’s first net-zero energy research building (meaning that it produces as much electricity as it consumes). To achieve the Institute’s admirable vision, McCarthy built the progressive facility with a variety of energy-efficient features throughout the building systems, such as a Lutron lighting control system that senses when and how much light is needed by occupants at any given time of day. Additionally, a cutting-edge building control and management feature enables building occupants to aid in achieving a net-zero energy footprint. The system displays real-time building performance in public areas, allowing the laboratory and office community to monitor their energy and water consumption against historical use patterns. Featuring high-performance architecture, the building massing and envelope reduce overall building energy use by maximizing daylight. Furthermore, on-site renewable energy is generated through two expansive photovoltaic arrays perched atop the building courtyard and roof. The 26,124-square-foot solar system allows the facility to consume almost 75% less energy than similar laboratories while also shading the courtyard and reducing direct sun glare into both the laboratory and office areas. The building’s functional, yet artfully-designed exterior is comprised of high-performance glazing, Spanish cedar wood and exposed architectural concrete. Contributing to the LEED credits in the category of Recycled Content, the architecturally exposed concrete walls, columns, footings, slabs and podium deck incorporate 30 percent fly ash, a building material known for its environmental benefits. During initial testing, the fly ash composition produced a marbling effect, making it challenging to create the intended aesthetic quality of the exposed concrete walls. Given the facility’s location in semi-arid San Diego, the team employed an aggressive water conservation strategy. Resulting from this effort, approximately two-thirds of the building’s water use is supplied by rainwater and condensation collected and stored in three interconnected underground cisterns with a total capacity of 90,000 gallons. The harvested water is UV-filtered and recycled for operating the cooling towers, toilet flushing and site irrigation, successfully reducing potable water demand by nearly 70%. Other sustainable design strategies the team incorporated into the structure include: natural ventilation and passive cooling, native low-water landscaping, roof gardens, high-efficiency plumbing, sustainably harvested wood, and use of regional and recycled building and finish materials. We have carefully assembled a project team comprised of the nation's top laboratory design and building professionals and are delighted to have McCarthy execute our vision for this unprecendented facility. Employing Target Value Design (TVD) strategies and fostering a team-focused culture were critical to the project’s overall planning and coordination. As part of the TVD process, McCarthy was brought in early to perform preconstruction with the goal of significantly lowering the initial estimated construction costs while enabling the client to achieve LEED Platinum status. TVD also allowed the project team to determine and schedule adequate time for long-lead items such as wood procurement, which was ordered a year in advance. The exposed architectural concrete on the building’s exterior posed one of the greatest structural challenges for the building team. 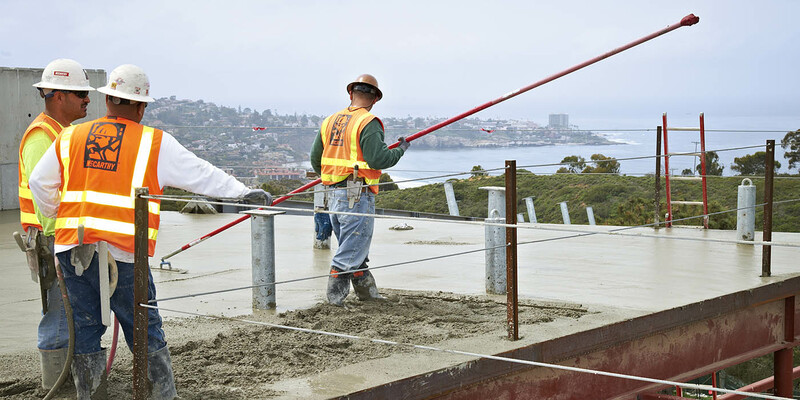 Architectural as-cast concrete is one of the most demanding concrete finishes, but adding 30% fly ash to meet LEED Platinum standards makes the process even more daunting. To ensure the desired aesthetics of the architectural concrete, McCarthy self-performed all of the concrete work, drawing on the expertise of the same concrete specialists who developed a pioneering concrete mix and installation procedure for the nearby Salk Institute East Building. Similar to the Salk Institute project, the concrete craftsmen created several generations of mock-ups to refine the mix design and fine-tune the finishing and forming techniques to produce the concrete’s smooth and flawless finish. The fast-track nature of the project added another level of complexity to the building’s exterior construction. The expedited schedule required construction of the architectural concrete to coincide simultaneously with mechanical, electrical and plumbing (MEP) coordination and enclosure/finishes design. Ensuring the correct location of block-outs and embeds required accuracy as well as timely coordination. Building information modeling (BIM) technology further streamlined construction of the project’s complex areas, playing a key role in mitigating rework by reducing conflicts among the various building components before construction began. McCarthy managed and hosted BIM software on an on-site electronic plan room to provide a shared, single-source of information for all members of the design and construction team. A cohesive team culture was achieved by focusing on the five “C’s” — collective, communication, coordination, collaboration and cooperation. All project stakeholders also participated in a formal partnering program with regular facilitated partnering meetings. This high-performance teaming process helped to align goals, eliminate waste, create team collaboration, and keep all members focused on a successful project completion. 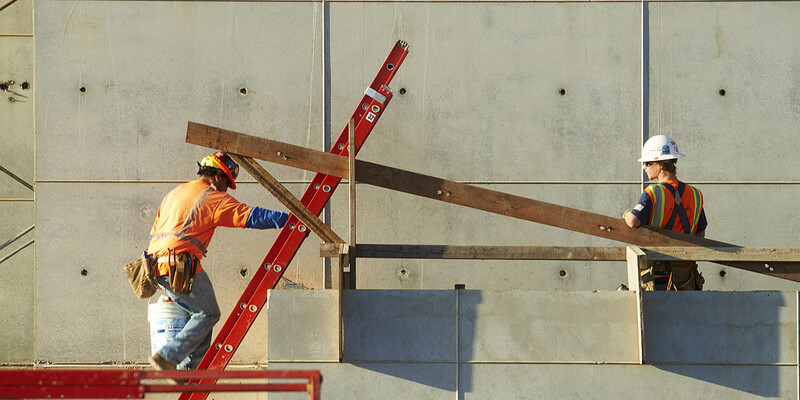 Through rigorous LEED tracking and high- performance teaming, McCarthy has successfully maintained a smooth construction process and kept the project on schedule toward our targeted completion date. Fueled by the same pioneering spirit that has enabled JVCI to lead the world in genomic research, the cohesive and experienced project team utilized the latest delivery methods and building technology to develop creative solutions. This inventive approach allowed the new facility to open as scheduled while meeting the Institute’s revolutionary design and programmatic requirements. Now touted as a masterpiece in modern design and construction, the J. Craig Venter Institute successfully solidifies San Diego’s position as a top destination for biotech research and is sure to become one of the area’s most iconic buildings. The project’s collaborative delivery process fostered a cooperative partnership environment wherein all members of the project team were focused on the project’s ultimate mission. This cooperative partnership effectively resulted in meeting the project’s many challenges and ultimately allowed the team to deliver the first carbon-neutral laboratory facility in the world. Containing some of the most innovative water and energy efficient systems available today, this facility now serves as a model for sustainable research buildings across the globe. But even more importantly, it provides a place for collaborative research and scientific breakthroughs, enabling the scientists it supports to discover new insights into disease prevention and treatment while protecting the environment for future generations to come. Our new facility was built not only to advance genomic research, but to showcase how science can be compatible with the best of environmentally sustainable practices. Construction completion of this remarkable building signifies the fulfillment of a long-time dream to return to the UCSD campus where I began my research career and now can collaborate with other scientists in the region to find solutions to our most pressing social issues.